I rec’d an ARC of “PROJECT OF BEING A WOMEN” from the author. In exchange for an honest opinion. This is Mismousey’s very honest opinion of Mr Taylor’s book. MizMousey- Looking over your bio I have seen that you wanted to write at an early age. Can you tell your readers about this? Tre- Yes. At the age of 9 years old is when I started writing. I use to write short stories and bring them to school; where my friends would read them and ask for more. That was the first talent I witness. Before a couple years later I discovered that I am a multitalented individual. So I know its hard for people to find out exactly who I am. I’m actually rather happy about that. I don’t want no definition. I am not a boy that can ever be define. Definition leads to limitations in my mind. I do not want you to know who I am; I want you to discover me. Discover every element about me. It’s important to be this way. Leave things for the mind to create. Be curious to find out what/ who is this young black openly gay man is/about. MizMousey-I see that your book is concerning the lives of 4 black women. Can you tell us who they are based off off?? But in truth couldn’t your book be based on the lives of all women in general? Tre–Yes I can. The women in the book are not based off of anyone. They are traits of women I’ve met that I created into 4 complex characters. But the characters are not anyone at all. They are from my imagination. It’s funny because I get this question a lot. It’s because I have a deep passion to dive deep. I like to dive deep in social issues and create from there. Women at the time of this novel were my social issues to discover. The women share something that creates and signals other women to have a connection with. The book can be based off women lives in general. I will not deny that. I think that’s why it’s so successful thus far. Because it’s a meaningful body of work that you can connect with. MizMousey-How did you come up with this book? Tre- How did I come up with this book? this amazing- phenomenal novel? I would like to say I wrote this book. At a very troubling moment in my life. I was a few months out of high school. I was looking for a path towards my goals. I started writing this book in august of 2013 and finished it in October 2013. It didn’t take me much time to create. The stories begin to flow from my fingertips as I created the first chapter. I did in fact listen to a lot of music during the process of creation. My go- to’s were Lauryn Hill, Michael Jackson, Nicki Minaj and John Legend. Also a little of Whitney Houston. The music helped me create the scenes in my head. I didn’t intentionally think I’ll write a book about women issues. It just mapped itself out through the music. I needed characters with great connection. The music helped me create and discover characters of great foundations of connection. MizMousey-what inspired you to write about the struggles of women? Tre-: My mom. My grandmother. And especially a lot of ground breaking – complex women I’ve met or read about. There was a story there that needed to be told. I found that outlet to tell their story. When reading you can see yourself or someone you know. That’s what I love about it because readers tell me how much they can connect with it. I think that’s the most rewarding feeling to have. To have people say you were telling my life story. It just sends chills down my back. Now that you have read a portion of his amazing in depth interview that he gave me. Let’s take a look at his first book that Mr Taylor wrote. Yes, it is about 4 different black women- but as I had asked the question. Can not in truth these stories be applied to the lives of all women?? When you read this book, you are reading the hardships that black women go through. This is from the authors point of view. I however- the mouse- say all women regardless of race go through the same struggles. Some maybe not as much. But we have our burdens and crosses to bear. Each women in the book has a different story. Veronica- Brenda- Laura and Sidney. They each go through -live through- and come through – there own type of hell. For Veronica she has a deep and dark secret that she keeping. One that is haunting her day and night. She does not trust men at all. Veronica has not even told her own mother what happened to her. In the process of putting her world back together again. She finds a man – one that she believes she can trust and build a life with. One night after making love- she decides to confide him her secret. Now – with Veronica story there is a lot more to it… I am not going to spoil it for you. I will give you a few lines from her story for you that are my favorite…..
“Thank you . I love roses! “Do you understand what you just ya’ll just did?’ Ryan screamed at everyone and scolded them as if they were children of his own then continued. Brenda– is a married women whom she thought was haeppy with a new baby. She begins to suspect her husband is cheating on her. She is working part time as a therapist. Brenda also decides to hire a friend college as private detective. She wants answers. As she begins to fill her friend in on why she believes her husband is cheating. Brenda relays what happened when she went to do the laundry on the night of her birthday. It was then that she found the condom wrapper in her husband’s back pants pocket. Richard tells Brenda that he will investigate Lance and find out who he is cheating on her with. Brenda is driving home – when she suddenly has an asthma attack. It causes a bad car accident. Not only does she end up in the hospital but so does the other driver. After the accident -Lance pulls so far away from Brenda . He wants to know why she was drinking. She denies it. It is then a young man by the name of Antonio comes in to her office. He tells her that he has been having an affair with an married man. But his lover will not leave his wife. The story with Brenda and her life / marriage. Is one that not every women goes through. But some women do. Those that do become stronger for there struggles. For those that do go through this – they might feel some what shameful. They shouldn’t – Brenda had courage-straighten-honor- and love. One afternoon she could’ve sworn she heard Lance crying on the phone. With Laura and Sidney both they are very complex. Laura herself- she is married to a wonderful man. However, he is pressuring her into having a child. Each month that she does not come up pregnant she feels a failure. The pressure begins to take a toil on her. So much so that she fakes being pregnant.. Laura’s story is one of what a women goes and does to have a child for her husband. And then- She knew that she was in too deep but at the same aspect she wanted this more than ever……looked into the mirror at Jill. Our last female an story is about Sidney. Yes, she her self is complex in so many ways. More than you would think by looking at her.First -Sidney at glance you say has it all.. A boyfriend -having an affair with a married man. in her eyes she has it all. Then she finds out she is pregnant. And before she can actually think about it an what to do. Sidney suffers a horrible miscarriage. The daddy of the baby thinks she had an abortion. Sidney attempts to get on with her life. She tells the married man she wants nothing to do with him anymore. To leave her alone. But will he?? Can Sidney actually have a life with her boyfriend?? What happens in Sidney life does happen to million’s of women everyday. You just don’t know it. In Project of a Women – Mr Taylor has recognized and Thanked several people. Those beings his mom Wanda, Grandmother Carolyn – Late Grandmother Gewn- The late Great Marilyn Monroe – Rupaul, Nicki Minaj and he also thanked you the reader for reading his book. PS : I pray to God , that the world understand the ART I give it. It’s missing desperately. May each tool you use build the way. In closing Mismousey recommends this book to everyone to read both young an old. I feel it has a message a for all women. Where you are black-white-red-orange-purple-not matter your color. The stories told concerning these 4 and following them. Can be about any women out there today. Mousey gives this terrific and very fast read a firm rating of 50 out 5 stars. 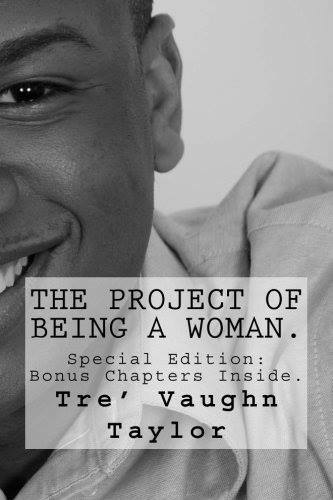 NOW RUN AND GET YOUR COPY TODAY OF PROJECT OF BEING A WOMEN!! YOU WILL NOT REGRET READING THIS AMAZING BOOK!! WHAT ARE YOU WAITING FOR??? ← ALL PROCEEDS GO TO THE NATIONAL AUTISM ASSOCIATION PLEASE SUPPORT! !